It's that time of the year. Time to drop some mad cash on your essential fall/winter wardrobe pieces - boots and coat. These two purchases are my most difficult of the year. While the rest of the year I shop too much and am constantly rearranging my closet to fit just one more cute dress in, as soon as that chill hits the air - shopper's block creeps in. I consider my boot and coat purchase EXTREMELY important and take my time humming and hawing over zillions of options every autumn. Why? Because it basically becomes your everyday-the-world-sees-me-in-this outfit! Unless you've got lots of money to spare, this is the reality. Last year, I was savvy and waited until about mid-season and purchased three pairs of boots, all totaling under $200. You can get some crazy good steals if you're patient and don't buy until about mid-December. I had to suffer through the first part of the season with very cold feet though. You've seen those girls, walking to the bus stop in minus 20 with their summer peep-toe heels, trying to still look fashionable and wearing tights to try and create some kind of barrier between their painted toes and the freezing cold air. Those three new pairs of boots I bought last year, are all still fabulous and all still in very good condition. The practical thing would be to wear those out this year.... but we all know fashion is not about function or practicality. 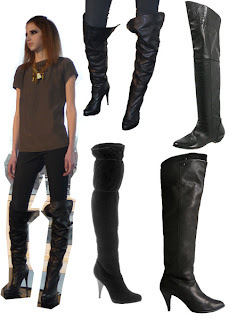 This season's must-have over-the-knee boots are not just calling my name, they're haunting my dreams. I just gotta have 'em. As for my new winter coat, I have fallen absolutely, madly, deeply for these 3/4 length coats from mangoshop.com.